Fine art, Illustration, graphic design and the art philanthropy of Sam Morrison: You Killa My Dog... I Shoota You Face! I took this photo while biking in the "bad" part of town. Trust me it's not a novelty sign. The sign says "...dogs." 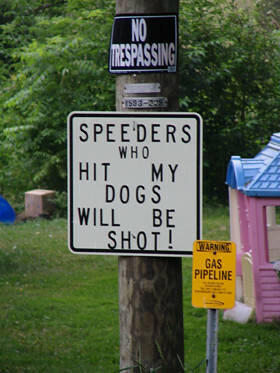 So does that mean I wouldn't be shot for hitting just one dog? What if I hit a dog -but wasn't speeding? Are we strictly talking about cars? What if a dog is struck by a bicyclist? Or someone riding a tauntaun? I'm thinking the No Trespassing sign is merely a suggestion. He'd probably welcome your questions. The guy seems reasonable enough that he'd be sure the punishment fit the crime. I believe killing his dog(s) while riding a tauntaun probably wouldn't get you shot. You'd be more likely to get disemboweled with a light saber. I'd ask just to be sure. Maybe even request your body be stored in the children's playhouse until the authorities arrive.